Two faculty members in the Department of Aerospace and Mechanical Engineering at the University of Notre Dame — Arezoo Ardekani, the Rev. John Cardinal O’Hara, C.S.C., Assistant Professor; and Assistant Professor Philippe Sucosky — have been named recipients of the 2012 National Science Foundation (NSF) Early Career Development (CAREER) Award. The award is the highest honor given by the U.S. government to young faculty in engineering and science. Since 2011, Ardekani has directed the Complex Fluids and Multiphase Flows Laboratory, which focuses its efforts on the fundamental properties of multiphase flows of Newtonian and non-Newtonian fluids relevant to biofluids, and micro/nanofluids for use in biomimetic applications, biomedical devices, alternative energy technologies and environmental remediation. Her CAREER project, titled “Fluid Dynamics of Bacterial Aggregation and Formation of Biofilm Streamers,” explores the implications of the hydrodynamics of biofilm formation. Biofilms cost the United States billions of dollars annually due to human and animal infections, product contamination and biofouling of membranes. Better understanding of this process could not only save millions of dollars, but could also impact environmental and human health and well-being. In order to understand biofilm formation and growth, the dynamics of bacterial aggregation at ecologically relevant spatiotemporal scales in the presence of flow while interacting with extracellular polymeric substances must be studied. Ardekani’s research group employs state-of-the-art three-dimensional computational fluid dynamics and experimental techniques to study bacterial aggregation and biofilm formation. In addition to the research efforts, all CAREER projects contain educational components to train the next generation of engineers and scientists. Ardekani’s project includes the development of a graduate-level course on complex fluids and features an interdisciplinary engineering education partnership with the Engineering and Technology Magnet Program for the South Bend Community School Corporation that focuses on restoring an aquatic ecosystem of a local creek by controlling bacteria levels. 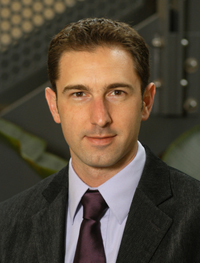 Prior to joining the University, Ardekani served as a Shapiro Postdoctoral Fellow at the Massachusetts Institute of Technology and is currently a member of the American Association for the Advancement of Science, American Chemical Society, American Physical Society, American Society of Mechanical Engineers and Society of Rheology. 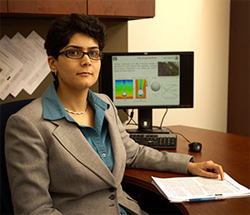 She received her doctorate (2009) and master’s (2005) in mechanical and aerospace engineering from the University of California at Irvine and her bachelor’s in mechanical engineering from Sharif University of Technology in Iran (2003). Sucosky’s expertise is in cardiovascular bioengineering, biofluidic mechanics, mechanobiology and biomedical device design. He directs the Multi-Scale Cardiovascular Bioengineering Laboratory, where his team applies state-of-the-art engineering techniques to solve challenges in the cardiovascular field and improve human health. Health issues studied in the laboratory include the causes of aortic valve calcification and the relationships between blood flow and heart valve disease. His CAREER project, titled “Contribution to Hemodynamic Shear Stress Abnormalities to Calcific Bicuspid Aortic Valve Disease,” investigates the role played by blood flow in the development of calcific aortic valve disease lesions in a congenital valve defect called the bicuspid aortic valve. According to Sucosky, “Calcific aortic valve disease, where calcium accumulates on the valve leaflets, is the most common valvular heart disease that can lead to heart failure.” Traditionally considered a genetic disease, research suggests that there may be other causes, which, when fully understood, might be prevented. The knowledge gained from this project will bring a new perspective on blood flow abnormalities in the bicuspid valve, and will help to develop predictive models to track disease progression. The educational plan that accompanies Sucosky’s research focuses on academic curriculum development and outreach activities aimed at increasing student understanding of the interdisciplinary nature of engineering and enhancing student ability to describe medical problems from an engineering perspective. He has also been working with Healthworks! Kids’ Museum, a local institution, to develop interactive exhibits on the human circulatory system to help children develop healthy lifestyles. Sucosky joined the Notre Dame faculty in 2008. Prior to joining the University he served as a postdoctoral researcher at the Georgia Institute of Technology (GIT). He earned his master’s (2000) and doctorate (2005) from GIT. 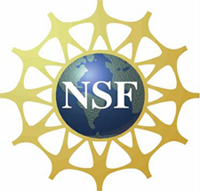 The CAREER program, which was established by the NSF in 1995, recognizes and supports junior faculty who exhibit a commitment to stimulating research while also providing educational opportunities for students. Originally published by Nina Welding at newsinfo.nd.edu on March 20, 2012.